26 February 2010, at 10:35a.m. US - A Mississippi State University (MSU) researcher has found that biology and computer science make the perfect combination for tracking animal flu viruses. 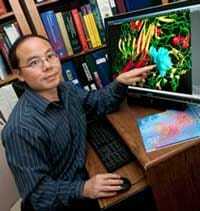 Henry Wan is an assistant professor in systems biology at MSU's College of Veterinary Medicine and has years of experience studying flu viruses. While doing graduate work in China, Dr Wan became the first scientist to isolate the highly pathogenic H5N1 avian influenza virus. Soon after this discovery, highly pathogenic H5N1 outbreaks occurred in poultry in Asia, Europe and Africa. More than 440 confirmed human cases across 15 countries were also caused by this virus. About 60 per cent of them were fatal. Henry Wan, assistant professor at MSU's College of Veterinary Medicine, developed a computer programme that provides a better understanding of why flu viruses mutate and how they spread. Dr Wan said: "I became very interested in influenza viruses during my education. My research centers around influenza A viruses – where they come from, why they change and how they spread." He developed computer programs that provide information on each one of the more than 20,000 viruses' gene segments. The program displays each gene segment and provides a map showing the distances between the segments. The information is used to determine how the segments relate to each other and group together to form different influenza viruses. He explained: "Influenza viruses are always changing. They reproduce to become more fit, or virulent, to continue to spread. The program aims to seek a better understanding of why they mutate and how they spread. Knowing this helps us more accurately predict when new viruses will arise." Dr Wan began developing the programs when he was a graduate student at MSU. He earned both a Master's in computer science and a doctorate in veterinary medicine at the university. He works closely with computer science experts to ensure the programs are tailored to exactly what he needs. Susan Bridges, professor in MSU's Department of Computer Science and Engineering, said: "Truly understanding the biological problem that needs to be solved is what helps us design appropriate computational solutions. Dr Wan has in-depth understanding of influenza biology and also of the computational problem that needs to be solved, making him an ideal collaborator." In addition to understanding the relationship between influenza virus gene segments, Dr Wan and his research colleagues seek to determine what environmental factors affect the spread of viruses. Dr Wan explained: "Virus transmission could be affected by a number of factors such as climate, population density of a certain bird species, and bird migration patterns. I am collaborating with researchers in the United States and in other parts of the world to better understand what environmental factors contribute to virus spread and mutation." He is working with researchers at Ohio State University to study bird migration routes in the United States, focusing on the four major flyway zones. Dr Wan's long-term goal is to use the research on influenza viruses to aid in the development and production of vaccines. Knowing the genetic code of viruses and predicting their mutation and movement can help scientists stop them before they become widespread. He said: "One of the flyway zones is here in Mississippi. Over the years, most of the attention has been focused on the Atlantic, Central and Pacific bird migration flyways. By expanding our focus to include the other flyways, we can gather information to better understand the movement of avian influenza viruses. "Our research on virus mutation and spread can help predict new strains of the virus and eventually aid us in foreseeing epidemics and pandemics. That information could be used to develop vaccines before the epidemic or pandemic were to hit."